With the LA art scene expanding so rapidly, it’s hard to decide which opening to hit first. Over The Influence, a gallery originally based in Hong Kong, had its debut in the LA Art district on Thursday (Feb. 22) and did not disappoint. Of course, Over The Influence is hardly a newbie to the art scene. They first began in 2015 with pop-up exhibitions in Hong Kong, later opening a physical gallery in 2016. Over The Influence premièred its new LA space with Portuguese artist Alexandre Farto—known as Vhils—and his striking show Annihilation (open through April 1). As an artist and avid gallery enthusiast myself, I couldn’t wait to check out this much anticipated space. Upon arrival, the energy of the show burst beyond the walls of the gallery as stimulated art viewers congregated outside onto the uncharacteristically cold LA streets. 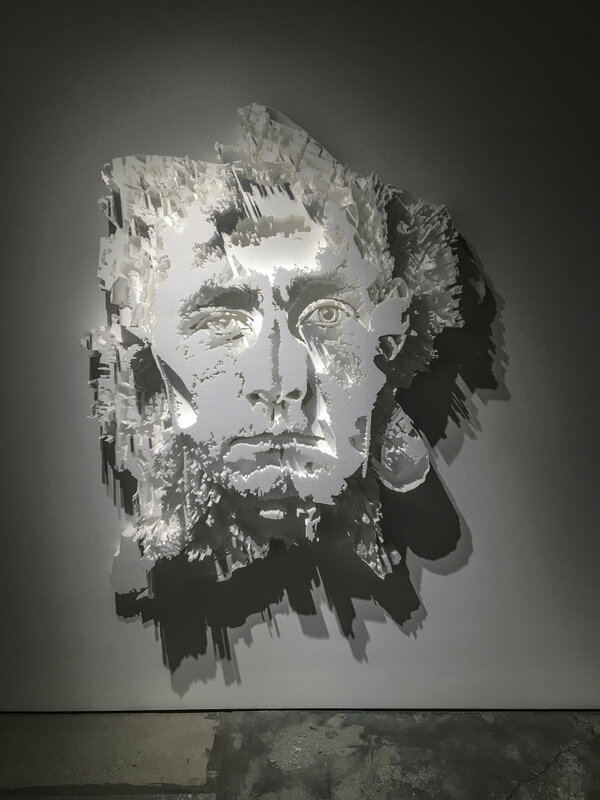 Once inside, one is immediately met with a striking three-dimensional carved portrait of Vhils’s work. The image of the face stands upright as the gaze of the subject meets the viewer so directly that one cannot help but to stop and stare back. The contours of the face are formed through a reductive process, as Vhils’ images are comprised of brutal, yet contemplative engraved marks, leaving a sense of consideration and intention. This brutally silent, visually intoxicating introduction strikes a spark of dramatic curiosity that draws you magnetically into the exhibit. Turning the corner after the initial entry, the gallery expands into a massive space where one room leads to another. The high ceilings and cavernous rooms are a perfect place to display artwork more typically seen on the street. Although each room was filled with the hustle and bustle of people, Vhils’ work creates an intense degree of intimacy, and the open space encourages viewers to continue exploring each piece. Fans of the artist will be happy to know that well-rounded range of Vhils' work is on display—the show featured landscape and figurative compositions crafted of source material collected from advertisements in cities worldwide. Constructed out of materials ranging from billboard, wood, metal and Styrofoam, the pieces contained multiple visible physical layers. These weathered layers bring to light a contemporary conversation with the foundation of a historical and site-specific context. The material, coupled with the expansive space, made for a cohesive and powerful dialogue between various cultures with an urban context. As a whole, Annihilation reflects on the impact of globalization on individuals and local community identities. Vhils’ goal is to “set up a dialogue between the United States, Europe, and China to address the growing struggle for hegemonic supremacy between global powers and the ensuing social and economic impact on the world at large.” No small feat, but after viewing the show, the craziest thing is, he’s done just that. I spoke with Over The Influence's Artist Liaison and Consulting Curator Lauren Every-Wortman. Read the interview below. Flaunt: What was the main incentive to opening “Over The Influence” in an LA location in addition to the space in Hong Kong? Lauren Every-Wortman: Los Angeles is a growing international hub for contemporary art. As a young gallery in Hong Kong, it made sense to try to reach an audience in the US because LA is still growing. Over The Influence hopes that it can have a greater impact on the art scene and create a dialogue between the US and China. What factors contributed to the gallery’s new specific location? It’s an exciting time to be opening in LA. The Arts District is rapidly developing and the art scene in LA in general is expanding significantly. The location, at the heart of the Arts District, is the perfect place for us to expand. We’re looking forward to being a part of this growing neighborhood. What was the thought process behind choosing Alexandre Farto—Vhils—as the first artist to exhibit in the space? How do you define the concept behind this show? Alexandre is a young artist who has already accomplished great success for his age in Europe and Asia. He has never had a solo show of this scale before in the US and we wanted to open the gallery with something fresh that we could bring to LA. The show reflects on the impact of globalization on individuals and local community identities. What other artists do you represent? What shows are to come? This year we have exhibitions with Nobuyoshi Araki, Nydia Blas, Cleon Peterson, Invader, Kathryn MacNaughton, Jerkface, and a curated group show by Aaron Moulton. What does “Over The Influence” have to offer to the LA art scene and what do you feel is missing from the art world that this gallery can offer? What is the concept behind the name “Over The Influence”? We work with artists who don’t always conform to the status quo, and are not influenced by the rigid structure of the contemporary art world. We’re creating a mix of established LA artists and artists with international acclaim to bring a more global perspective to the art scene here. I heard you’re planning to open a curated store as part of the gallery. How will that enhance the viewer’s experience in regards to the art collector from the casual gallery goer? We’re going to be selling products made in collaboration with artists as well as upcoming new designers. Throughout art history and even the present day art world, women artists are less represented than men. With the current social and political climate in regards to gender equality and women’s rights, do you foresee “Over The Influence” addressing these issues through the artists they represent or in any other regard? It’s definitely something we are acutely aware of and working on. Our goal is to have a balanced roster by the end of the year, and represent as many voices as possible so that we can start to build a more equitable art world.